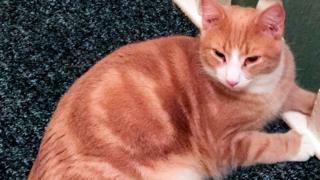 A couple from west Belfast have enlisted the help of a pet detective in a bid to find their beloved cat Spencer, who went missing in November. Marta Larkin, 36 and her fiancé Michael McGrath, 47, hired a pet sleuth from Dublin to help locate the ginger feline. First reported in the Belfast Telegraph, the couple have spent £1,000 on advertising and flyers. Enter Ireland's own Ace Ventura - Robert Kenny - pet detective extraordinaire. They hired his Dublin based company to try to recover Spencer. Robert, who qualified as Missing Animal Response Technician (MAR) in Fresno, California, told the BBC he loves his unusual job. "I fell into it back in 2007 when I rescued a dog on holiday in Monterey, USA. It was drowning and didn't have an owner. "That spurred me on to do the MAR course. I brought the concept into Ireland and have had lots of work," he said. Robert works all over Ireland, the UK and Europe tracking down missing moggies and disappeared dogs. And he does have a sidekick, the aptly named gun dog, Ace, who has helped in the recovery of many lost cat cases. Since 2007, Robert says the company has recovered about 4,500 cats and dogs. He told the BBC the rate of cat recovery is about 72%. However, dogs prove more difficult to find. Robert says canine recoveries are lower at 48%, as so more dogs are stolen. "Predominantly in Northern Ireland they would be stolen and then stay within Northern Ireland", he added. One of his colleagues has been working with the family in Belfast in the hope Spencer may be found. Marta Larkin told the BBC that Spencer had been suffering from health problems since they adopted him as a kitten. "We got Spencer and his brother Feidhlim last September after seeing them on a Facebook page. "Their mother had passed and we drove up to Derry to get them. "When we brought them home - they both had ringworm which had to be treated right away and Spencer had a bad eye infection. "He had to have an operation and has been on medication since," she said. However, four weeks ago Spencer went missing and the couple have been doing all they can to get him back. "We originally had Facebook advertisements which covered a 10-mile radius but extended it to a 30-mile radius as there was a taxi depot nearby and he could have ended up in a car." The couple who are both huge animals lovers, told the BBC their six cats are their world, but they have a special place in their hearts for Spencer. "Spencer is the definition of a perfect cat - my partner and I say it took us six cats to get the perfect one. "He has to get cuddles five times a day. "We just want him home - it doesn't feel like Christmas without him". We hope Spencer makes it home for a purrfect Christmas with his family.